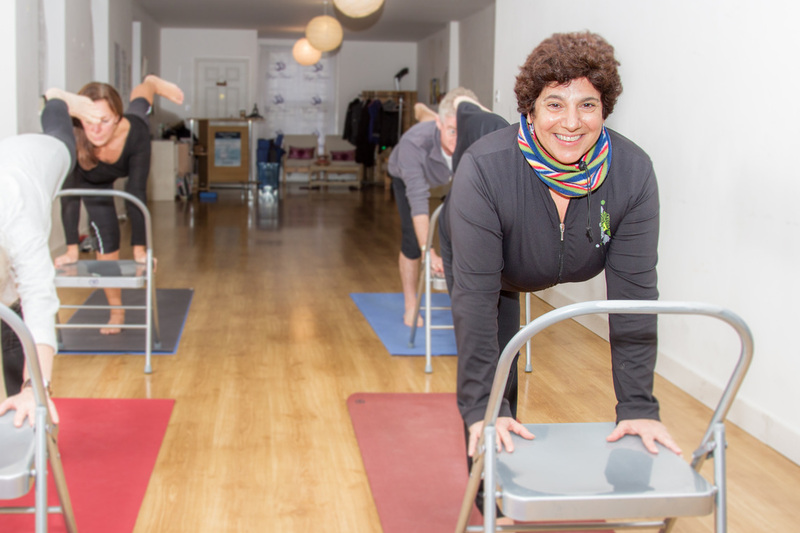 With Degree in Sport Sciences and Physical Education, Claudia has been working as a Yoga, Fitness Instructor and Physical Education Teacher for more than 30 years. As a former Gymnast who represented her country (Argentina) in international competitions and coached a few champions herself, Claudia is a rare and skilled mix of knowledge (in anatomy, kinesiology, physiology, developmental and bio mechanical movement, yoga, fitness) combined with compassion and understanding of the limitations we can face in the classes but overall, the amazing opportunities that a Yoga class can offer us to reconnect with ourselves and discover who we really are and how strong and powerful we can be! Claudia’s classes are taught in a caring, fun and safe environment with her light hearted argentinean signature flavor! Her classes are student-centred, adapting each class to the participants' specific needs. You can expect feel comfortable and welcomed, even if you feel too stiff or too unfit, even if you have never tried before. She will help you to make peace with yourself and your body and feel ok just being you! From that starting point of acceptance of your present state of fitness, flexibility and strength you will be able to feel great, happy and relaxed. You can also be sure that you will be in good hands if you like to advance in your practice! She truly believe that Yoga is for everybody (not matter your age or size or your level of fitness!) for that reason she teaches Yoga to adults, teens, Active Retirement, Men, Athletes, Special Needs and different styles (“I don’t limit myself or my students to only one style of yoga, I love it all! !”) so everybody can do it! (Regarding her fitness classes she has been told that she may suffers with a Dr. Jekyll and Mr. Hyde disorder as she transforms herself from a soft, nice and sweet lady for her yoga classes into a maniac fitness instructor! You need to experience for yourself and discover which Claudia you prefer! Some people choose both! She has worked in Argentina, Italy, Spain and since 2009 here in Ireland, teaching different classes and styles (from coaching international champions, to children in schools, to people all ages and walks of life) in different countries and environments that made her understand the undeniable truth that we are all in this together and we all want the same things: happiness, understanding, peace and love. For that reason (and maybe because her mum was a Doctor in Philosophy and Anthropology too!) she is constantly learning about philosophy and psychology to try to help her students (and herself) to understand our human nature. She trained this year to become Hay Louise teacher so she can help people (on and outside the mat!!) to overcame fears, low self - esteem and learn how to trust in the process of life and in our own personal powers. She has passion for continue learning and training. She never stops! During her career she attended hundreds and hundreds of workshops and courses with worldwide known teachers in Yoga, Gymnastics and Fitness. She has been featured in the Irish Times (twice!) for her Yoga classes for Men and for her Special Need Classes. Also in the Positive Life magazine and for her Body Toning class was featured recently in Mintmag.ie as one of the 10 best fitness classes in Dublin! Claudia is also the author of Yoga for Computer Users, a DVD, designed to offer a relief to the symptoms people get with long term computer use, helping to improve posture, flexibility and general strength as well as increase body awareness. You can watch some of her videos in Youtube! Claudia is known for adapt the Yoga exercises to you. Not the other way around! 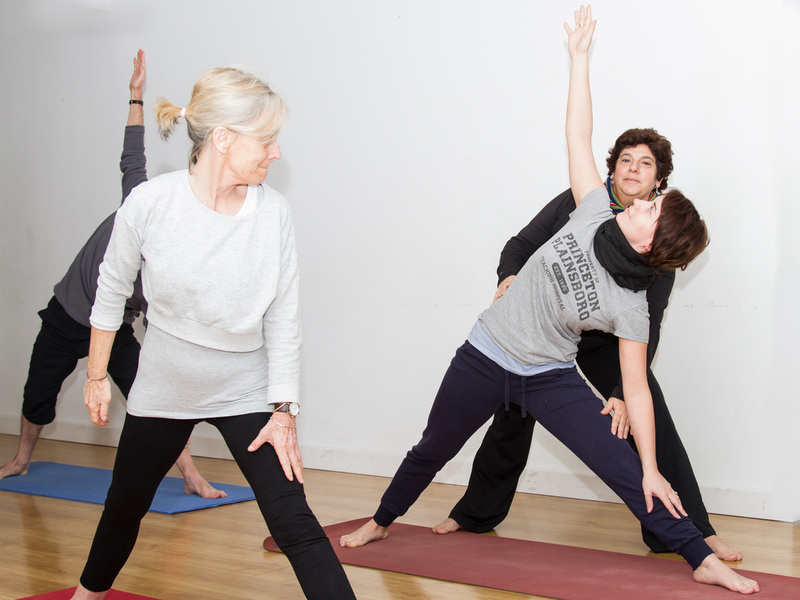 Elements like mindfulness, lightness and deep awareness in grounding and connection are part of Claudia’s classes – and so are joy and humour. The classes are suitable for all ages and all levels of ability. Claudia will help you to be mindful with your practice and to learn how to listen, honour and respect your body. I took my first class at Yoga fitness last October and I was instantly hooked!. Claudia is a gifted teacher and a constant inspiration. Her compassion and sense of humour create a relaxed and enjoyable environment in which to learn! My yoga and body toning practice has positively affected both my physical and mental well-being and Claudia’s enthusiasm and warmth motivate me to integrate yoga into my life. My only regret is that I didn’t start much sooner. Finding Claudia’s classes was like finding a little slice of heaven. I had heard her classes were good but that does not do her justice- it’s more than that. She has something special no one else has. We (ie. the people in her classes) have discussed this amongst ourselves and agree that she really has that perfect mix of professionalism and friendliness because she really knows her field so well and she has such a beautiful open and warm personality. She s a former gymnast so her conditioning classes are tough but brilliant, great fun with great music. No matter what your fitness level is, she is encouraging without pushing you too far. Her yoga classes are trully wonderful. She sets the tone with her calm and gentle manner. She knows everyone’s name and we all practise at our own pace in a relaxed and peaceful atmosphere. She is just very good at what she does and I’m so glad I’ve found her and this place- it doesn’t feel like an exercise studio- it feels like home. Claudia is a truly wonderful teacher – gentle, genuine, encouraging and extremely skilled at explaining and demonstrating yoga positions. I have felt enormous benefits, both physically and mentally, since attending her classes and cannot recommend her highly enough. I started going to Yoga Fitness a few weeks back when the muscles in my right knee stopped me from hiking up the Wicklow & Sligo mountains. I knew that yoga was the best way to regain full fluidity in my body because of Ryan Giggs, Manchester United striker, and I was lucky enough to go to Claudia’s class for a free first session. She is by far the best teacher of Yoga I’ve experienced, always directing you with clear instructions, allowing the body to fully stretch into the pose before moving on in a continuous motion throughout the class that leaves me feeling energised, limbered up, and awake. She a brilliant teacher and I’m sticking with her for the winter months because I need to be in top shape when the Spring comes and I get out onto those mountains again. Up to last year I always had Yoga down as a class that only women did. I was initially quite sceptical about starting, but I'd now say it's been the single most beneficial change I've made for my running, cycling, swimming and football. I'm injured less and find that my recovery time between sessions (especially running) has reduced. My balance and stability has improved in hill running. My general flexibility has increased and I even notice simple things like less discomfort when sitting at my desk for long periods. The classes in Yoga Fitness are accessible, open, and well paced, allowing you to improve in your own time without feeling overwhelmed. I can't imagine not having Yoga as a regular part of my week now! Sign Up Today to receive Yoga Fitness News!